I thought it was a grand idea! It was quick, easy, inexpensive and most of all fun! I had seen the idea in a magazine and was eager to try it out. Although it wasn’t the best traveling costume, I felt it was worth the inconvenience. 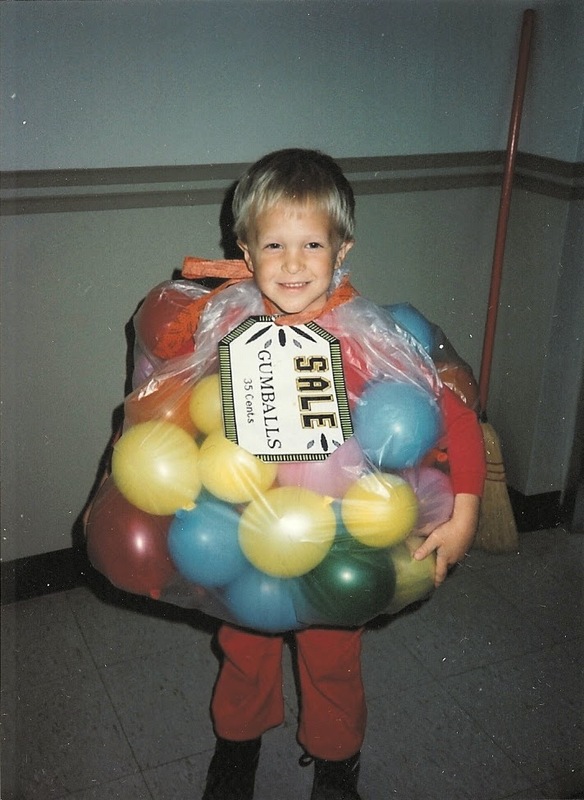 This was twenty five years ago, but my son still remembers the costume. I would like to say he remembered it with fondness… he was only five years old, who would have guessed? But, he hated it then and still complains about what I “did to him” all these years later. I tell him to “let it go”. He smiles and shakes his head. We’ll see what transpires when HIS children start dressing up for Halloween. I still think it is a marvelous idea for younger school-age children, so I will share it with you. A little jar of gumballs! Only 35¢ please! – 1 piece of card stock cut to look like a price tag. toward the top of the bag- one on each side. Your child’s size will determine where these holes go and how large they should be. 3. Dress your child in solid color pants and shirt. 5. Carefully slip the child’s arms through the arm holes in the top of the bag. surrounding your child until you achieve the desired shape. 7. Attach the SALE sign onto the drawstring of the bag. small child due to this step. For safety there is the assumption that you are with your child during putting the costume on and taking it off as well as during the wearing of this costume. Common sense must prevail. When Halloween trick-or-treating is over make sure to have fun with the balloons! Use the empty trash bag to collect the balloons when finished playing for easy clean-up. Have a Fun, Safe and Happy Halloween! Blog posts are many times an extension of this book. We started at 500+ and are counting upward and onward!